The Alaska Department of Environmental Conservation is considering a state sought permit to apply an herbicide to 3 Fairbanks area water bodies infested with the invasive plant Elodea. 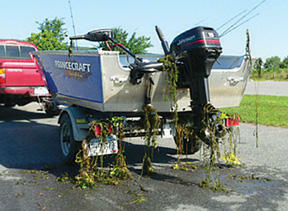 As KUAC’s Dan Bross reports, floridone has proven successful at battling back the aquatic weed known to choke out fresh waters. Elodea hangs off a boat at Chena Lakes.